At Propertyology, we are currently assisting clients invest in seven strategically selected locations across Australia. As our regular readers would know, in one of these locations, the most affordable, we have bought several properties for less than $250,000! With history showing us that over the last 15 years, affordability has been one of the main drivers of property markets across Australia, we do not recommend our clients spend more than $450,000 on a single investment property, anywhere! We believe there are much better ways to utilise your investment capital and investment cash flow than tying up $600,000, $700,000 or even more, in a single asset. Investing, whether it be in property or shares, is about building wealth, but it is also about minimising risks along the way. Ultimately, property needs to be treated as a financial instrument (just like shares) and investing in property should be as emotionless as possible. This is different to the purchase of a family home for example, which is a decision filled with emotion. Do we like the suburb? Is it close to your work, or your kid’s school? Is it close to family? Is the layout and design what you want? Whilst these emotional questions are important when choosing the family home, selecting an investment property should firstly be about the location. It is very common that first time investors will purchase close to where they live because they ‘know the area’. Is this a good investment decision though? Or are there other locations in this big country called Australia that based on economic conditions and industry outlooks, would provide a safer and more astute investment decision? Studying property markets Australia-wide is what we do every day. Choosing the right property within that strategically selected location is then a lot more complex than simply searching online real estate portals. What is the general demographic of the location? Which pockets of town are flood prone or have zoning restrictions? What plans do council and senior town planners have for future development? Which streets appeal to locals and which ones don’t? What is the general demand for accommodation or shelter? What is the historical and forecasted supply? Should we be investing in houses or apartments based on the answers to those previous questions? 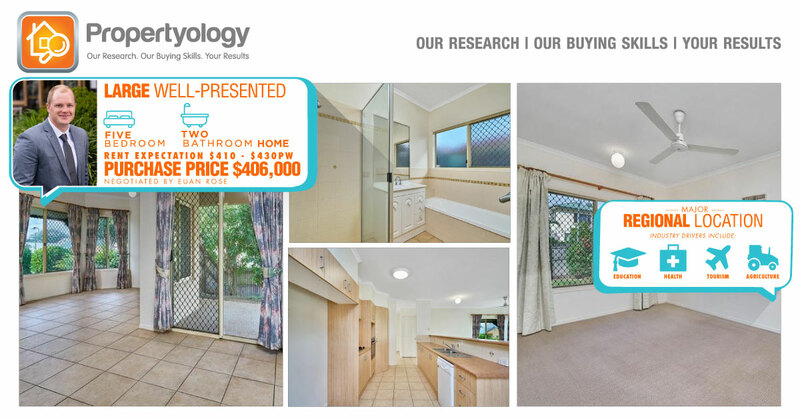 This is just a tiny example of the level of research Propertyology undertakes and carefully considered prior to formally recommending this location and this specific property to first time clients, Chris and Tanya. Whilst this particular property is very appealing cosmetically, it might even be the style of property that Chris and Tanya would live in themselves, that isn’t the reason it was selected. The fact that the property has four large bedrooms, an additional study/office, two bathrooms as well as several large living and entertaining areas, isn’t even the reason we selected it. This property meets our strict selection criteria for properties we are purchasing in this location. It is situated in one of our ‘acceptable streets’, is the right style of property for the local demographic, appears to be low maintenance and in good condition. Situated approximately 10 minutes to the centre of what we currently consider Australia’s most exciting regional location, this particular property received a rent appraisal from an independent local real estate agent of $420-430 per week. Taking all of this into consideration, along with the fact that our independent market appraisal suggested that this property was good investing if purchased up to $425,000, the biggest cherry of all has to be the fact that our Buyer’s Agent Euan Rose was able to negotiate a purchase price of only $406,000! Congratulations again Chris and Tanya! A great result.